Much is brewing around downtown San Jose these days; some things have been in the works for decades. 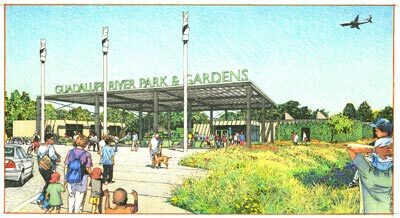 Included in those decades-long planning efforts are master plans for Guadalupe River Park and Guadalupe Gardens. Adopted by the City Council at the turn of the new millennium, these plans lay the ground work for our future – decades from now. Elements of those plans are being visualized so we can realize them. We have an extraordinary opportunity to create an iconic park in downtown San Jose – and we have the need. By the year 2035, San Jose is projected to have an additional 400,000 residents as well as BART and high-speed rail at Diridon Station, major corporate campuses nearby, and more high-rise urban residential housing. Downtown is shifting to the west and the Guadalupe River Park is the nexus between our current downtown and that future expansion. With the support of a grant from the John S. and James L. Knight Foundation and in partnership with 1stACT, we engaged Ken Kay Associates for a visioning exercise for Guadalupe River Park & Gardens. The resulting vision concentrates on three areas of the park: signature art installations and performance space in Discovery Meadow, family-friendly trails, and spectacular improvements to Guadalupe Gardens that maximize and unify the entire 120 acres. Adjacent to Rotary PlayGarden, a replacement plan for a stunning new Visitor and Education Center. Replacing our current bunker, and bringing the outside in for our events and education, this vision places yet another jewel in the crown of downtown San Jose.